The plan for the day was to continue my perch quest, this time on the Thames. I ordered a new rod online from a company called Tidal Tackle early Tuesday and was expecting it to arrive in my office on Wednesday - nope. Nor Thursday or Friday either - rather crap service - either it takes them a week to put it in a tube or they sent it by carrier sloth! 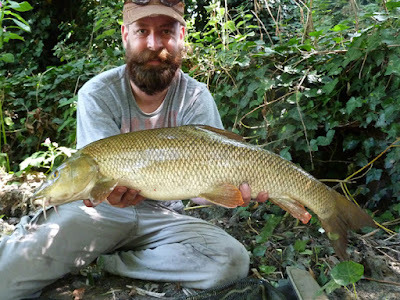 New plan, take my barbel tally up to 70 fish, and hopefully find some bigger ones. I soon had a barbel of about 2½lb - so much for the bigger fish. And working my way down stream I found some more 7lb 11oz, 7lb 15oz (my best of the season so far, I shook the scales but couldn't make it an eight) and 6lb 0oz. And even a couple of bonus chub to 3½lb. 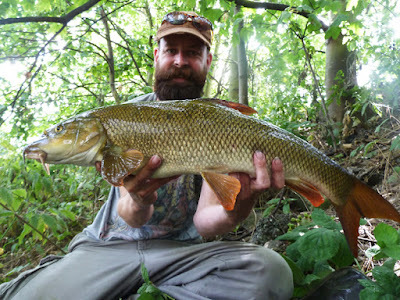 This time last year I was on 2 barbel, so a target of 100 is definitely on the radar. And as far as I can tell only two are recaptures this season. The carrier sloth has sprained his ankle, luckily the carrier slug was available.